Hello! It’s been a whirlwind of a few months here at Appetite for China HQ. There have been many late nights of editing, classes for the Brainery and private clients, a few photo projects and new cooking experiments undertaken, a long-overdue trip to Hong Kong, many sleepless nights, and many more cups of coffee. 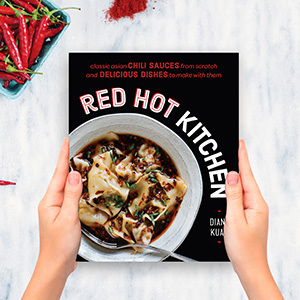 I am thrilled to let you know, though, that my second cookbook Red Hot Kitchen will be out February 5th, 2019! (And it’s available for pre-order now!) I know the next 2 months will also fly by, but along the way I’ll be posting updates, fun sneak peaks, and giveaways here on the blog, on Instagram, and on Facebook. Cooking new spicy foods, or DIYing hot sauces, definitely makes the dark dreary days of winter a little more exciting. Earlier this week I conducted a poll via Instagram stories for which spicy dish you’d like me to reveal in today’s post: Shanghai Hot Sauce Noodles using Sriracha, or Vegetarian Bibimbap using gochujang? The first few hours the race was neck and neck, but by morning Shanghai Hot Sauce Noodles pulled ahead to be the clear winner, by a margin of 2 to 1. I personally love both dishes, but do realize that Shanghai Hot Sauce Noodles are a little lesser known here in the US and might be a bit more intriguing! Even though Red Hot Kitchen teaches you to make Sriracha from scratch, you can use store-bought versions in this recipe. Reprinted from Red Hot Kitchen by arrangement with Avery Books, a member of Penguin Group (USA) LLC, A Penguin Random House Company. Copyright © 2018. When I lived in Shanghai, la jiang mian was found on almost every street corner, at quick eats restaurants that catered to bustling lunch crowds. A piping hot bowl of noodles and spicy broth with tofu, peanuts, and a generous helping of chili sauce was the ideal quick lunch, and I slurped countless bowls a week. In Shanghai, the restaurants usually only use doubanjiang (a Chinese fermented, salted chili bean paste) for the heat. At home, however, I like to pair doubanjiang with Sriracha to make a version that retains the same heat but is less salty than the restaurant versions. 1. Heat a wok or large pan over medium-high heat until a drop of water sizzles and evaporates on contact. Add 3 tablespoons of the vegetable oil. Add the peanuts and fry until they start to turn golden, about 2 minutes, being careful to not burn the peanuts. Reduce the heat to medium. Add the chili bean paste and Sriracha and stir-fry with the peanuts just until fragrant and the oil starts to redden, about 20 seconds. 2. Add the onion and cook until translucent, about 2 minutes. Add the carrot, tofu, ginger, and sugar and stir-fry for another 30 seconds. Add ½ cup of the vegetable broth and cook, stirring constantly, until the liquid has evaporated. Add another ½ cup of the broth and repeat the process. (This allows the peanuts, onions, carrots, and tofu to absorb more flavor.) Finally, add the remaining 4 cups broth and bring to a boil. Reduce the heat to medium-low and simmer for 20 minutes. 3. Meanwhile, bring a medium pot of water to a boil and cook the noodles according to package instructions. Drain and divide into individual bowls. 4. Pour the broth over the noodles. Garnish with the scallions and serve hot.